What is Business Manager, and Why Do I Need It? Simply put: Business Manager is a management system for your ad accounts and ad permissions. If you plan to ever have more than one ad account (in other words, more than one store, brand, or business) or if you will have a team of people that may need access to your ad account/s at some point, then create a Business Manager account. I usually suggest that everyone go ahead and create one for themselves before they get started with Facebook Advertising to remove any pain points down the road. The only downside to Business Manager is that once you switch to it, there is no turning back. You’ll no longer be able to access your ad account from your personal Facebook page anymore. 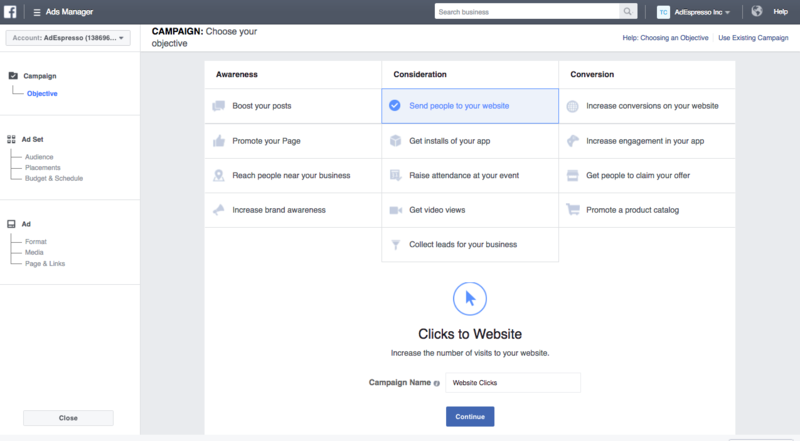 However, you can easily log into your Business Manager at any point here to manage your Pages and Ads from here: https://business.facebook.com/. Regardless of the switch, even if you continue to use your personal ad account, you’ll still see the same two options of ad management and creation: Ads Manager and Power Editor. Ads Manager and Power Editor are two sides of the same coin; they are Facebook’s ad creation platforms. They’ve become so similar over the past year that it almost seems that they’ll fuse into one another at some point. Nonetheless, to keep it clear, you can use either of these platforms to accomplish your advertising goals. Starting out, if you’re going to use the default Facebook system, I’d suggest using Ads Manager as it is more user friendly than Power Editor. Once you’ve created a few campaigns with it, feel free to move onto Power Editor to see if you prefer it. Campaign Import - For people with multiple ecommerce stores, it allows you to import multiple campaigns (i.e. hundreds of ads). New features are always released in Power Editor first - This may give you a competitive advantage for any new ad types or targeting options. Manually saving a draft - In Ads Manager, you can’t choose to “Save as a Draft”. Facebook will auto-save this for you, but I’ve had issues in the past where this “auto-saved” draft was nowhere to be found. Occasionally these platforms can become overwhelming with information and technicality (a huge reason reason why we created AdEspresso), and reporting can be its own hassle-- but we’ll dive more into solutions later in the guide. In the meantime, let’s move on to what is arguably the most potential Facebook caveat of all: The Facebook Pixel.